In the last three years or so, the Carpe Diem learning design process has evolved – not only as a result of our own better understanding of it, but also as a consequence of the open educational resources (OER) agenda. Carpe Diem is a creative, hands-on learning design process for academic course teams. It builds institutional capacity in learning design. It is not a ‘techie’ workshop on how to use certain tools. It has proven to be effective in the design and redesign of face-to-face, online and hybrid programmes at undergraduate and postgraduate levels at over 15 UK universities and internationally. Carpe Diem delivers a blueprint and a storyboard for the course, a set of peer-reviewed and reality-checked e-tivities running online, a model for further development and an action plan. The planner used during the two days is available as an OER under a Creative Commons licence. Developing a storyboard is at the heart of the Carpe Diem process – it’s collaborative, productive and fun. When we populate the storyboard with content (‘content’ is never our starting point! ), participants usually refer to two ‘default sources’ of materials: previous versions of the course and new materials that the course team will have to ‘write’. We then introduce the concept of OER and show a few examples. While some colleagues are now more familiar with OER than three years ago, many have not heard of these resources, the repositories they are stored in or the licences they can be used under. They are often surprised by the amount and quality of open, free material they can access and incorporate into the course, with and without adaptation. I usually invite course teams to conduct a resource audit under five headings: 1. course materials they already have and wish to reuse (such as materials from previous versions of the course), 2. material from OER repositories ready to use as is, 3. OER they can use with minimal changes, 4. OER that need repurposing before inclusion in the course, and 5. what they need to create from scratch. 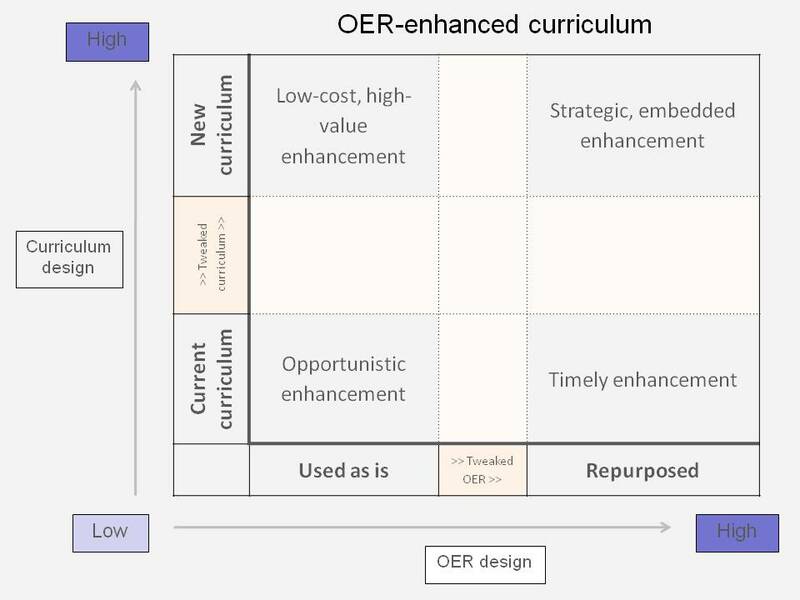 The figure below maps curriculum design against OER design and shows the types of enhancement that can be achieved during the planning, development and delivery stages of a course. The top-right quadrant requires significant effort (and delivers accordingly), while the bottom-left one constitutes rapid, ‘opportunistic’ enhancement at a minimal cost. The development of a critical mass of OER worldwide and the awareness that the OER agenda has raised across the higher education sector have been critical levers in the evolution of Carpe Diem as a learning design intervention. Thus, Carpe Diem today does not only meet its original collaborative learning design objectives cost-effectively, but raises awareness of and disseminates OER and open practices across disciplines and institutions. We’re privileged to be hosting a visit by five South African colleagues this week. Paul, Peter, Jason, Mpine and Leoni from Unisa are taking part in a series of activities in the Media Zoo, including a ‘compressed’ Carpe Diem and a variety of presentations and workshops led by Beyond Distance colleagues. Our South African colleagues are planning major changes in their e-learning provision, including developing capacity and exploiting the affordances of new learning technologies. They might even create their own version of the Media Zoo! We hope that they take maximim benefit from their visit to Leicester, which has given us the opportunity to learn from the experience of Unisa, one of the largest providers of higher education in the world. We were all very excited to learn this week that Beyond Distance has won a major international e-learning award as a result of its work on an online course offered by the Department of Politics and International Relations at the University of Leicester. 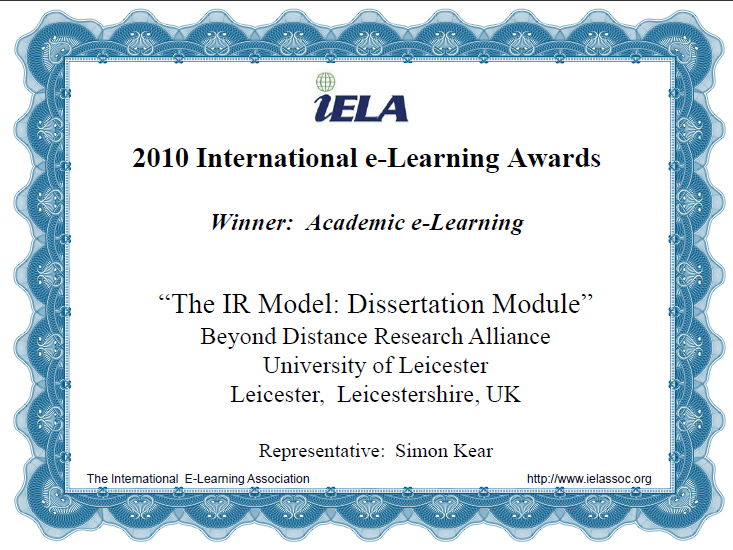 The International E-Learning Association (IELA) selected the Dissertation Module as the winner of the Academic E-learning category. Drawn directly from the Carpe Diem learning design process, the Dissertation Module is part of a highly successful suite of distance learning MA courses in International Relations at Leicester. The Dissertation Module uses e-tivities – a key component of the Salmon 5-stage model – that incorporate Web 2.0 technologies such as blogs and wikis to scaffold learners towards a structured path to a coherent, interesting and viable dissertation topic. 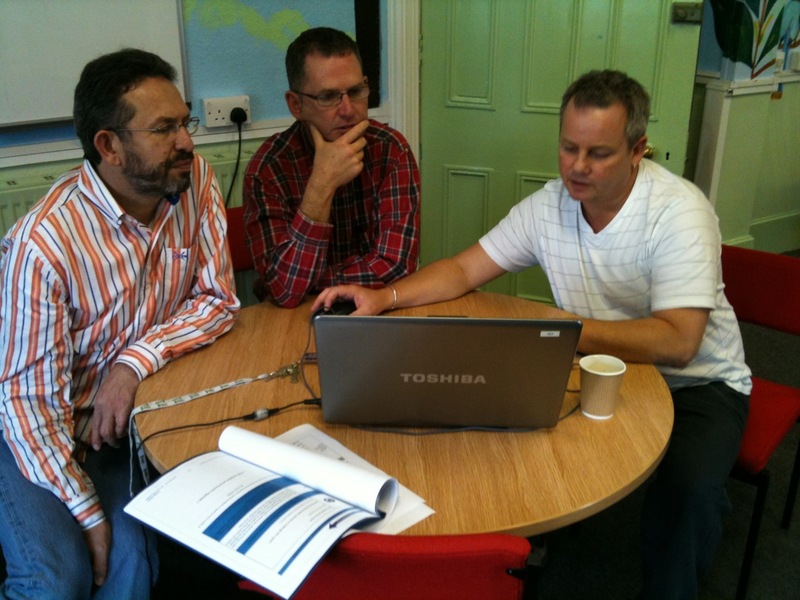 The adaptability of the Dissertation Module has seen it adopted by other distance learning departments at the university. It is also available as a fully repurposable open educational resource as an output of the OTTER project. The Dissertation Module is the result of successful collaboration between departments, services and individuals, and illustrative of what can be achieved by drawing upon skills and experience contained within the University as a whole. Please visit the distance learning pages of the Department of Politics and International Relations for further details on this and other modules on offer. The Beyond Distance team has delivered a number of successful two-day Carpe Diems in recent weeks. Three of them have taken place at Liverpool John Moores University, where over 60 colleagues in three disciplines (Health, Psychology and Built Environment) have taken a proactive approach to designing for effective learning and assessment. They explored creative ways of designing e-tivities that capitalise on the affordances of a range of learning technologies. Many of the designs made use of wikis and will be incorporated into the delivery of these programmes from September. In some cases, the new designs are already in use, as part of LJMU’s summer schools. At Leicester, colleagues from the Greenwood Institute of Child Health are planning a new distance learning programme in Child and Adolescent Mental Health. They joined us in the Media Zoo for a very productive two days. The Inter-Professional Education team, including colleagues from De Montfort, Northampton and Leicester, also took part in a Carpe Diem to prepare their new Diabetes online module. Carpe Diem and other Media Zoo activities enable academic teams to design effectively and to deliver smarter. Colleagues learn to maximise the impact of stable and new technologies and ensure that students benefit from these innovations. As more colleagues continue to seize the day, Carpe Diems and Media Zoo activities will continue to ensure sustained enhancement to the learner experience. Ale wrote several days ago about our ten visitors from Finland. At that stage, we were mid way through their four-day schedule, which finished officially yesterday afternoon, but unofficially yesterday evening after a pleasant meal in a local pub. As this was the first time I’d taken part in such a visit – which included a two-day Carpe Diem – in my new role as Keeper of the Media Zoo, I thought it useful to reflect on the experience. Overall, I believe it was a success for both sides. Our Finnish colleagues assured us that they took away with them a clear idea of what Beyond Distance does, and they certainly seemed to be fizzing with the way they could incorporate what they learned about podcasts, OERs and learning design. There were also highly appreciative of and complimentary about the project presentations made on Day 1 and Day 4, espcially those by our institutional partners in Psychology and Education. And as Ale said, we certainly were impressed with both their understanding of pedagogy and what works in teaching, and their comfort with technology. (Within five minutes of opening their laptops on Monday, all ten were happily eating up our wireless network bandwidth with no help from myself or Terese.) It also appears that Finnish HE students are similar to ours in one important respect: they don’t read any of the printed handouts either! Our new physical Media Zoo stood up well to the task. At one point, it held 18 people very comfortably, with all interaction at a conversational level. The new murals – inspired by the graphics in the Second Life Media Zoo Island – drew warm praise. But we will be rethinking our proposed layout and the positioning of the technical equipment. In a sense, we were very fortunate to have such a rigorous test of the room prior to any major purchasing decisions being made. And of course, we made some great new friends. So cheerio for now to Eva, Kristina, Matti, Ritva, Taina, Tuula, Elina, Tiina, TK and of course Irma, who organised the trip so effeciently. Ten Finnish academics from Laurea University of Applied Sciences are visiting Beyond Distance this week. Their overall purpose is to learn about our research in e-learning and learning technologies, our projects and our approaches to learning design. A two-day Carpe Diem workshop has been organised as part of their visit. Our visitors come from a range of disciplines including health care, business and management, tourism, safety and security management, languages and of course, learning technology. They have engaged with our work very enthusiastically, and they have gelled very well as a group – most of them didn’t know each other prior to their trip to Leicester. Although I was expecting this, I am still surprised by how competent and knowledgeable our Finnish colleagues are in the field of learning technology. For example, all of them were familiar with Second Life, knew what wikis were and how they can be used (in fact, many of them have been using wikis with their learners for some time), and none of them was put off by the ‘complexities’ associated with using learning technology. All fluent users of their VLE (Optima) and very relaxed about Web 2.0… this compares very favourably to my experiences with academics elsewhere, including my colleagues at Leicester. We’re half-way through the week and we’ve all learned a lot from each other. A fantastic opportunity for mutual development and future collaborative work. I was at the Higher Education Academy conference this week in Manchester. http://www.heacademy.ac.uk/events/conference. I heard Dame Tanni Grey Thompson speak after the (excellent) conference dinner. Dame Tanni is a great Olympic Athlete. http://www.tanni.co.uk/biography.html. Her biography is called ‘Seize the Day’ – a phrase Beyond Distance is fond of – we called our learning design workshops CARPE DIEM (http://www.le.ac.uk/carpediem). But how she has seized everything and what an inspiration! Her ability to take and understand constant critique whilst maintaining absolute determination and independence of spirit shone through in every word. Though thankfully very few of us face and overcome the disadvantages of paralysis from our early lives, as Dame Tanni did, I guess we all have our burdens which can appear to get in the way, of personal and professional achievement, and the enabling of others to excel. The principles that I got from her talk were clear: the need for planning and preparing for success – sheer hard slog, team work, forward-vision and aspiring to make dreams come true. I think it’s not too fanciful to apply these to the future for learning- indeed I think we should do nothing less! !